This paper was presented as part of the Plenary Symposium “Tomorrow’s learners, tomorrow’s teachers: Autonomous development in English language learning and teaching” at the Japan Association of College English Teachers (JACET) 49th annual convention in Sendai, Japan. September 9th 2010. My contribution to this symposium will be to comment on the role of a learning advisor in promoting learner autonomy. During this conference there has been a lot of discussion about the role of the teacher in fostering learner autonomy, but probably not much has been said about learning advisors. I realize that the role of a learning advisor may not yet be well understood, so I will begin with a definition. I will then go on to describe the role and the processes involved and also give some examples of typical advising scenarios. Firstly, I need to say that the title “Learning advisor” is by no means universal. In other contexts we are called counsellors, helpers, facilitators, mentors or consultants. When David Little set out his initial (often cited) definition of learner autonomy in his 1991 book, he began with listing what autonomy was NOT. I think it would be very useful to take this approach before unpacking what advising in language learning IS. So, please keep that in mind as I talk about what functions the process of advising is likely to incorporate. Of course, many of the functions I have just listed are fulfilled by classroom teachers and so they should be! 3. What is the difference between a language teacher and a learning advisor? There are a number of differences between the role of a learning advisor and a teacher, and here are two. Firstly, as Voller (2004) notes, advising requires “an overlapping, but fundamentally different, set of skills from those employed in classroom teaching”. Secondly, Kelly (1996) observes that the nature of the discourse employed by teachers and advisors is different. She describes advising as “a form of therapeutic dialogue that enables an individual to manage a problem” (Kelly, 1996:94), and this is quite different from discourse usually employed by teachers. 4. Why do we need learning advisors? I am not arguing for the replacement of good language teachers or language classes, but I am suggesting that having dedicated learning advisors available in addition to classroom teachers would be very helpful. Language teachers tend to need to focus on covering language functions according to a syllabus. Depending on the syllabus and class size, this might not necessarily leave space for adequate individualized advising opportunities. A learning advisor, on the other hand tends to work outside the classroom and outside class time (often in a self-access centre) and is available to work with individual learners on their needs. These needs might not necessarily be the same as the aims of the language course that they are taking. In addition, language classes tend to be compulsory, whereas offering learners the opportunity to discuss their learning outside of class can (and should) be voluntary. This means that the learners take the responsibility for making the decisions, including the decision about seeking help in the first place. 5. Where do advising sessions take place? Many programmes that offer an advising service have an Advising Room – Students who want to make an appointment with a learning advisor often meet them in this advising room. This is often located inside or near the self-access centre. Many self-access centres have a Help Desk. This is a desk in an open space where students can drop in and ask questions. No appointment is necessary. The questions aren’t always about language learning (see Crowe, 2009) but the interactions help to build rapport and trust between the learners and the advisors. There is also the Self-access Centre itself. Casual advising often occurs in the SAC and often starts naturally. A learning advisor might make a comment about a DVD or book that a student has selected, for example, and the discussion goes on from there. These brief casual encounters often lead to learners later coming to the help desk or making appointments with a learning advisor. Classroom. Depending on the course, this can work quite well (see Carson, forthcoming). For example, some elective classes at Kanda University of International Studies (in Chiba, Japan) allow students to create their own personalized syllabus. The courses are facilitated by learning advisors and although there are some input sessions, students spend class time on activities that they have chosen to do. The learning advisors then circulate and talk to individual students about their work. The learners also complete weekly journals or blogs so that the teacher can read in detail about what they are doing and how well they feel the activities are addressing their learning goals. There is also advising in a written form (through diaries, blogs or self-study modules). Students undertaking a course of self-directed study at KUIS interact with their learning advisor in writing. Writing about their learning helps the learners to develop metacognitive awareness and it also gives the learning advisor a good indication of how the work is going. Some students prefer the written dialogue as it gives them thinking time, especially if they are less confident with speaking (see Mynard & Navarro, 2010) – we do most of our advising in English. 6. What happens in an advising session? In a regular language class, a teacher can plan the objectives, materials and homework. Teachers can usually plan and predict how a class will run. Learning advisors cannot often predict what will happen in an advising session and need to adapt and be responsive to what the learner brings to the session. 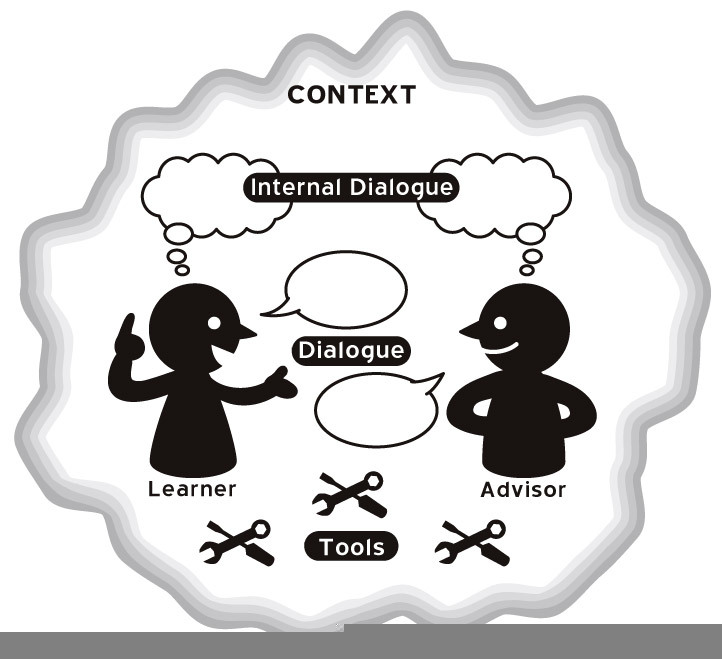 The model shows the dialogue between the advisor and the learner. As you can see, the learner is doing the talking and the advisor is doing the listening. The advisor is listening, questioning, guiding, encouraging and other skills used by counsellors (See Kelly, 1996). Inner dialogue is also very important, which is why silence is important. The learner is thinking through how he or she is learning. The learning advisor is processing this and planning how to best guide the learner to make deeper connections. Learning advisors draw on various tools to facilitate the process. Tools may include activities such as a needs analysis task, a learning plan, a progress chart or a motivation graph. The context is also significant and this diagram shows that the context is constantly changing. A combination of dialogue, tools and contextual factors guide the advising process. A learning advisor holds off on giving suggestions and firstly spends time asking questions to find out exactly what the problem is (see McCarthy, 2009, for a good example of this). Maybe the student mainly has trouble listening in a particular situation, for example understanding her teacher. Once the issue is pinpointed, some strategies and materials for addressing it can be discussed. This is often by followed by a kind of action plan. Ideally the learner and the advisor become partners in the advising process (Karlsson, 2008). Identifying needs and possible courses of action is co-constructed through negotiation and interaction rather than taught or prescribed by an expert (Mozzon-McPherson, 2001). In order to effectively promote autonomy, learning advisors need to consider the rate and readiness of the individual learner to take responsibility. A skilled learning advisor should also be able to provide the appropriate amount of support for each individual. I want to get 600 on the TOEIC. What should I do? How can I organize my vocabulary? The advising for self-directed learning courses is often different as it looks at a programme of work in progress over a longer period of time. Advising is often done through a combination of written and face-to-face advising, takes longer and is more thorough. So, I have given an overview of what a learning advisor does and what happens in an advising session. Although advising is a relative new area within applied linguistics, I foresee rapid growth in interest particularly because of the resources and tools available on the internet. Learners are now able to source their own language learning materials to supplement their classroom learning, but they will inevitably require guidance in doing this. Kelly, R. (1996). Language counselling for learner autonomy. In R. Pemberton, E.S.L. Li, W.W.F. Or & H.D. Pierson (Eds). Taking control: Autonomy in language learning (pp.93-113). Hong Kong University Press. Mozzon-McPherson M. (2001) Language advising: Towards a new discursive world. In M. Mozzon-McPherson & R. Vismans (Eds. ), Beyond language teaching towards language advising (pp. 7–22). London: CILT. Mynard , J. (forthcoming). A suggested model for advising in language learning. In J. Mynard & L. Carson (Eds.). Mynard, J. & Carson, L. (Eds.). (Forthcoming). Advising in language learning: Dialogue, tools and context. Harlow: Longman. Mynard, J., & Navarro, D. (2010). Japan Association of Self-Access Learning (JASAL) Forum: Dialogue in self-access learning. In A. M. Stoke (Ed. ), JALT2009 Conference Proceedings. Tokyo: JALT. I do believe in Autonomous Learning as the ideal learning paradigm, yet, in general terms, the educative world order is quite distant from this perspective. It is highly convenient to work out the suitable strategic mechanisms for us, language teachers, politicians and educative specialists and officers, to work on a different curricular model, able to foster learner’s autonomy. For instance, students should develop techniques to use a dictionary independently which happens to become a powerful tool to extend lexical competence, functional grammar notions (thanks to the variation of examples of usage) and phonetic notions. But teachers don’t believe in this. They’re not used to the autonomy in language learning.